Everest Base Camp Trek does not offer merely a trekking opportunity but it also offers a diverse sightseeing opportunity. Mt. Everest, every trekker's dream has a great legend of Sir Edmund Hillaryand Tenzing Norgay Shrepa. Due to this legend, trekkers' flow is spiralling into the Everest region. 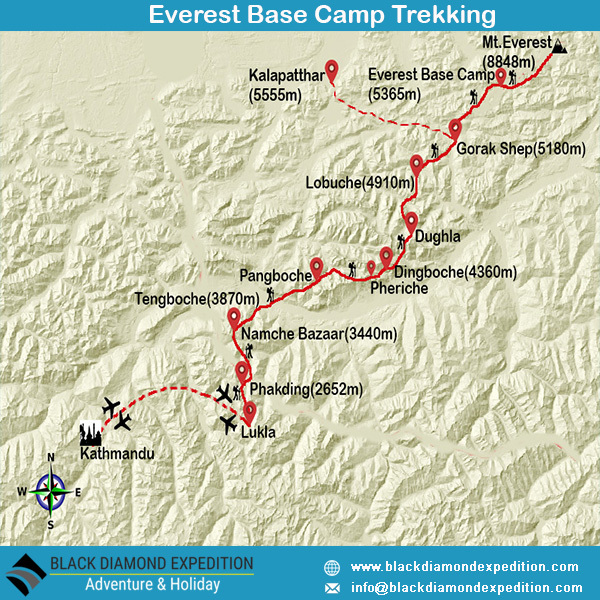 Everest Base Camp Trek is considered as a trek full of tragedy and triumph. The scenic beauty, soaring mountain peaks and picturesque villages scattered through this region offers once in a life time opportunity to enjoy breathtaking beauty of the nature. Everest Base Camp (5364m) is the entry point of the summit of the World's highest mountain in the World. The appealing manifestation the Everest has really attracted millions of people from all over the World. Besides these, a day in Namche, the capital of Sherpa, offers you an opportunity to experience their culture. Visiting Thyanboche monastery, world’s highest monastery and the most important cultural center of Khumbu region provides you an opportunity to explore Sherpa culture. Everest Base Camp Trek is considered the most popular trekking destination in the Earth by attracting millions of trekkers for their holiday trekking. You will have an enthralling experience while ascending to Everest Base Camp whereas the unrivalled views of Mt. Everest, Mt. Lhotse, Mt. Nuptse and the surrounding peaks from Kalapatthar (5545 m) is indeed mesmerizing and spellbinding. You will really experience the wonder of Thyangboche Monastery beneath the shadow of Mt. Ama Dablam. The best seasons for trekking to the Everest Base Camp are Autumn (Sept to Dec) and Spring (March to May). The weather is sunny and warm making the views outstanding in these seasons. The weather condition is the primary issue during the Winter (Jan to Feb) season for trekking to Everest Base Camp. The region offers a freezing cold during winter. Just opposite to this, EBC trek gets affected by monsoon during Summer/ rainy season (June to August). Nevertheless, this time is the appropriate time for a keen and enthusiastic Botanist. Early morning after breakfast transfer to Kathmandu airport's domestic terminal to fly over Lukla, a gateway destination for trekking in Everest Region. After 40 minutes adventurous and scenic view flight, we reach in the Tenzing Hillary Airport at Lukla. Here we meet our other crew members and then we begin our first day's easy trek through forest, villages and along the Dudh Koshi River to Phakding. Today also we follow the Dudh Koshi River and cross suspension bridges many times, one of which is the famous Hillary Suspension Bridge. On the way, we can see the beautiful view of Mt Thamserku (6618m). Passing through the small village of Benkar, Chumoa, Monjo we enter in to the Sagarmatha National Park. We cross the last village of Jorsale before Namche and then gradual walk through the forest and bridges until we reach the confluence of Dudh Koshi and Bhote Koshi Rivers (Larja Dobhan). After then about 2 hours steep climb we reach Chautara from where we get the first sight of Mt. Everest. From there another 1.5 hours easy walking bring us to Namche Bazzar, the gate way to Mt. Everest and the main trading center. Today the trail is gradual ups and downs with the magnificent view of Himalayas and Musk Deer, Monal, Blue Sheep may come across on our way while walk through the jungle. We begin the day with gradual walk down up to Kayanguma, passing by Tenzing Norgye Memorial Stupa and viewing massive Ama Dablam, Lhotse Shar, Taboche, Thamserku more snowcapped peaks. After then little ahead we reach Sansa, the junction to Gokyo Valley and Everest Base Camp. We follow the right trail to Everest Base Camp through pine forests and come across the bridge over Dhudh Koshi River in Phungi Thanga. From there the trail is little steep through the forest of rhododendron and fir trees to Tengboche village, the home of biggest Buddhist Monastery of Everest region and the close up view of massive Ama Dablam, Nuptse and Everest is very impressive. We continue the journey through gradual down from rhododendron trees and again come across the suspension bridge over Dudh Koshi River. About an hour further walk will bring us to Pangboche which offers a dramatic view of Himalayas and village. Passing by several Chortens, Mani walls and Pangboche Gompa we continue the trek through the village of Syomare, Orsho and Samso Ogma. From there we follow the right path and after crossing the bridge over the confluence of Khumbu Khola and Imja River we climb steep path to Chyakunwa Kharka from where we can see the spectacular view of Taboche, Ama Dablam, Khangteka, Thamserku, Nuptse, Lhotse and many more. After few minutes gradual climb we will be welcomed by chorten and prayer flags in Dingboche. Today all the way is dry but offers awesome Mountain View on all sides. We start the trek walking gradually through the Khumnu Khola Valley and reach the yak herder’s place, Dusa (4503m). After then following the narrow trail we reach Phulung Karpo where camp site was asserted during first successful Everest Expedition in 1953. Further the sight of Chola Lake and Mt. Pumo Ri (7161m) appears on the way. As we descend the trail the view of Mt. Pumo Ri disappear and come across the roaring stream. We cross the small wooden bridge and climb steep up to Dughla. Dughla offers marvelous view of Nuptse, Cholatse, Thamserku and several other magnificent peaks. Those participants, who had choose option 1 yesterday (Kalapatthar), will visit Everest base camp today. And who had choose option 2 yesterday (Everest Base Camp); they will hike to Kalapatthar today for sunrise view over snowcapped mountains including Mt. Everest and then wait for other participants to return back in Gorak Shep. After having lunch together in Gorak Shep we trek back to Dughla via same route and then follow the right side trail to Pheriche.